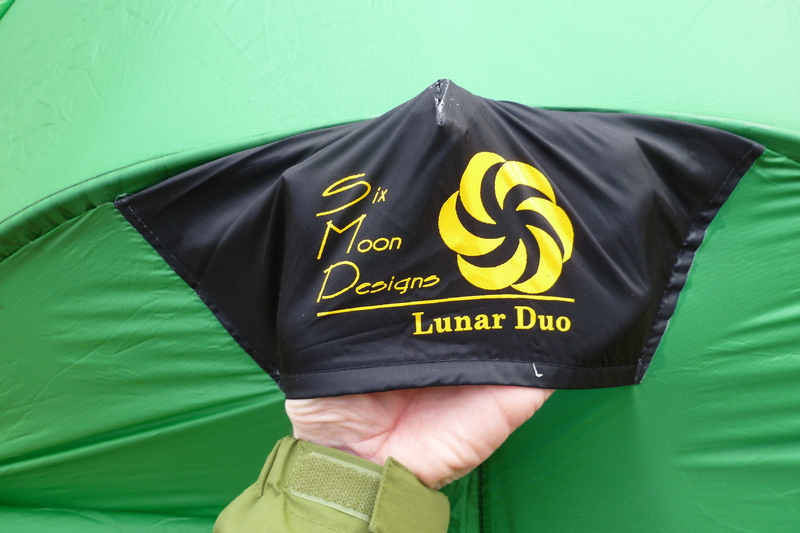 My new Six Moon Designs Lunar Duo tent showed up on my doorstep today! I bought this to replace my heavier and smaller Kelty Grand Mesa 2 tent for when my wife or my son goes out with me. I will save approximately 30 oz but my interior space is much more usable/livable. It may not sound like much but going from 29 ft2 (which was limited all around the perimeter due to a sloped wall and shorter dimensions) to a 34 ft2 floor has a huge advantage. In the Kelty tent my sleeping bag would always rub the foot-end of the tent and the hood would even touch the door on the front. This was due to the sloped walls at the head and foot. I didn’t like my bags touching the walls which is why I wanted such a large floor space for two. However, I also wanted something that was as vertical as I could get it. This is the cool thing about the Lunar Duo, all around its perimeter the walls are indeed vertical. Of course there is some compromise here though. At the head and foot the bathtub floor is sewn to a fine no-see-um mesh which goes straight up about a foot or so where it meets the walls going up. (The picture below shows this.) Due to such a long floor length and this vertical area, there is so much room my sleeping bag on top of a NeoAir or a taller Exped air pad will not even come close to hitting the tent walls! As you can see, there is indeed plenty of room. 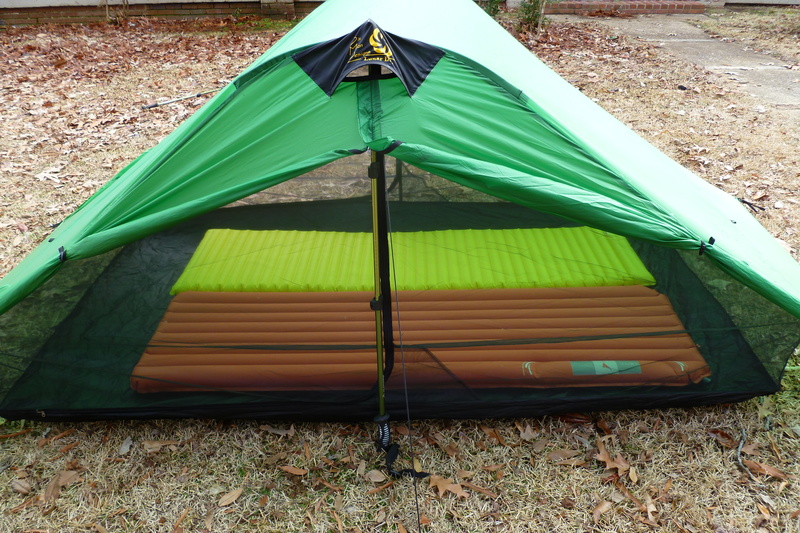 I opted for the UL floor since I plan on using a ground sheet under the tent. I thought about using a polycro ground sheet but I figured that the silnylon by itself is slick enough, so I ordered a large Tyvek ground sheet from Six Moon Designs with the tent. 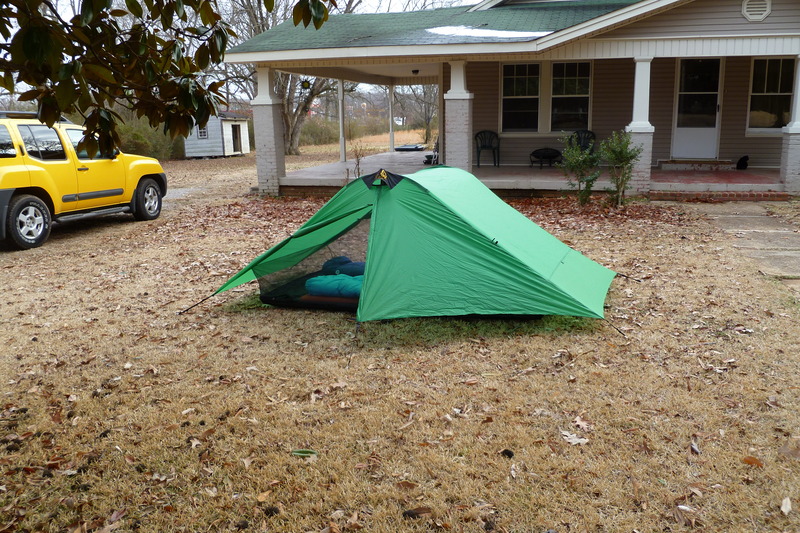 The Tyvek sheet is listed at 48″ x 84″ which is just a little smaller than the tent’s floor but that will be ok. 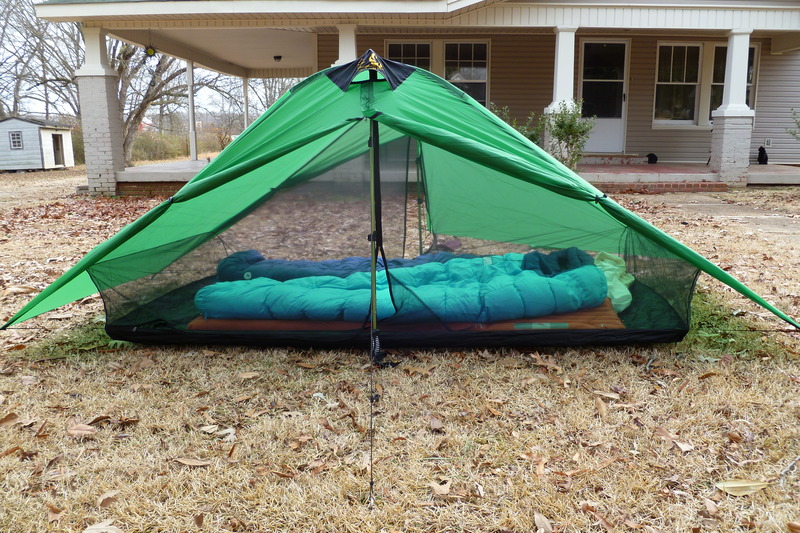 The tent came in a green stuff sack made of the same silnylon as the body of the tent with a cord lock to cinch the top closed. Of course the tent also came with the two ceiling poles. As far as the tent, there are a few loose threads that I will cut away that are mainly found where the no-see-um mesh is sewn, however, they do not give me any reason to worry. Although, there is a seam on the top of the vents that is directly over the tip of the trekking pole (can be seen in very first picture). I figure that this (tent) is a well thought out design, but I will keep an eye on this seam since a large amount of pressure will be put on these two spots, which hold the tent up. If this seam were to split the trekking pole could possibly go through the tent, which would make it hard to keep the tent erect. Stakes: Depends on what I take. 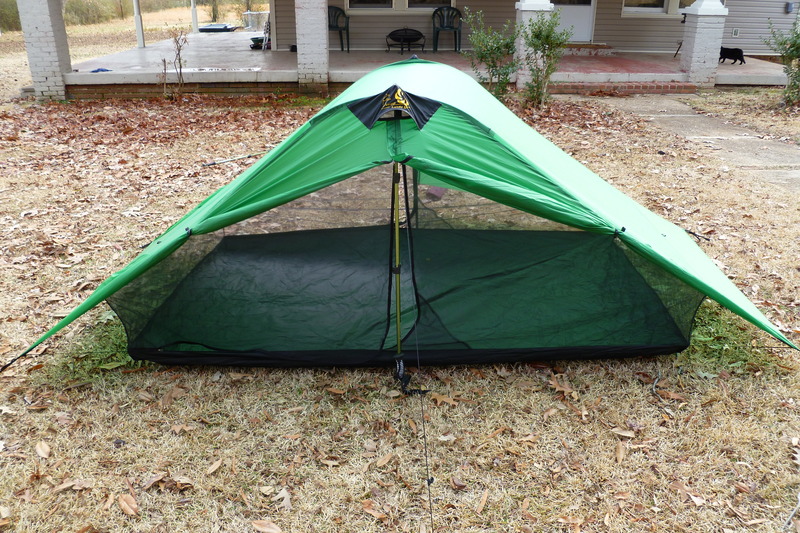 Lastly, this tent does require the use of trekking poles to pitch, but for those that do not use trekking poles, Six Moon Designs does sell an optional Carbon Fiber pole to use instead. For me, I like to carry trekking poles when I hike so I will be using these. At the moment I carry 2 Outdoor Product flick lock poles I got at Wal-Mart a little over a year ago. These poles have been great, but they are due a replacement. To replace them I will be going with the regular Gossamer Gear LT4 adjustable poles, just as soon as Gossamer Gear has them available again (which should be in the next couple of weeks). EDIT: Due to my impatience I went ahead and got a pair of Leki CorkLite Aergon SpeedLock Trekking Poles. I still plan on getting the Gossamer Gear LT4 poles, but now I must wait a little longer… However, these poles will work great with my new Lunar Duo! This entry was posted in Gear, Gear Stores, Tent and tagged CorkLite Aergon SpeedLock, Exped, Gossamer Gear, Kelty Grand Mesa 2, Leki, LT4 Trekking Poles, Lunar Duo, NeoAir, Six Moon Designs, tents, Trekking Poles, Tyvek Ground Sheet. Bookmark the permalink. Greetings from England. I reckon you’ll be more than happy with the Lunar Duo. I’m a big fan of Ron’s gear and have been using the LD on a number of trips with my wife. For two people it is really spacious so that, even if you do get minimal condensation (which is inevitable in our climate) you can easily avoid any contact with the walls. Great design and easy to pitch (not as perfect as your pics though) and light enough for one person to carry (me). Will look forward to hearing how you like it. Have fun. Hey! Thanks for checking out my blog. And I completely agree with you about the Lunar Duo. It is great as far as I can tell. The one thing I will need to do though is to fine tune how I will handle the floor moving around so much. As far as the pitch, I give that credit to Ron and the design. I have set it up twice, and both times it has been super simple. 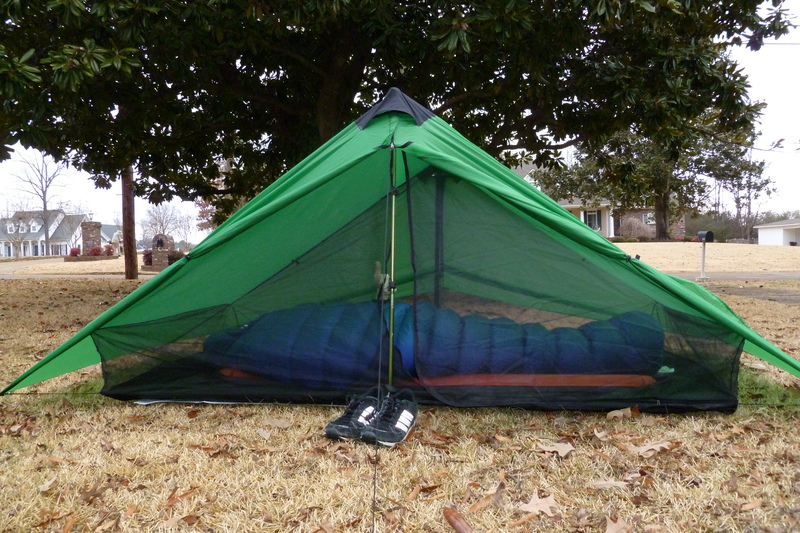 I have an old SMD Refuge-X, the cuben version of the now discontinued Refuge tent, which is similar you your new tent. Mine is quite spacious, but not as large as your Lunar Duo. I hope you like it! Thanks Alan for checking out my site! That might just be the best pitch of a Lunar Duo I’ve ever seen. I can’t say mine ever looked so stately. Thanks Green Giant. That was my first pitch ever with the tent, and only minutes after I put my hands on it. However, the trekking pole on the back (the side opposite the side with the “Six Moon Designs” logo on the vent) was actually a little lower than the front side. This was due to the fact that the trekking pole was slipping. 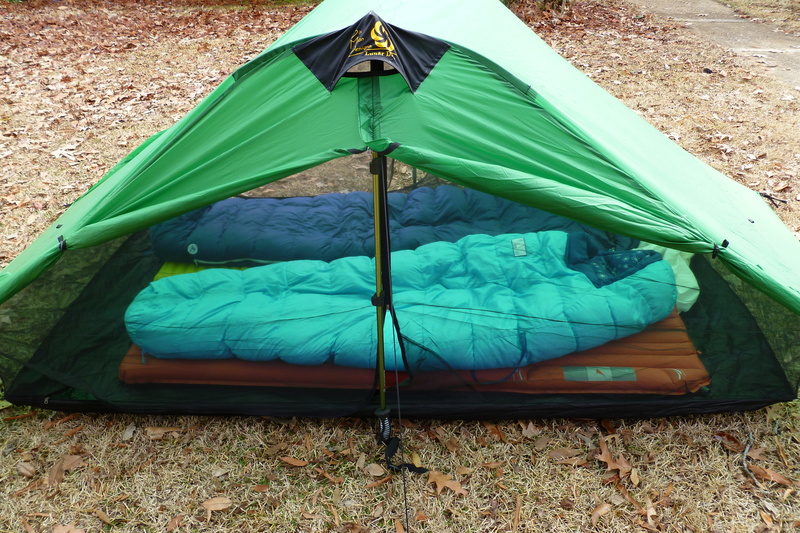 It will not hold up under the pressure needed to hold the tent up at the 45″ mark. Therefore I am getting new trekking poles. I will say that in my post I indicated that I was getting the GG LT4 poles, but due to my impatience I went ahead and picked up a pair of Leki’s. I will still get the GG poles, it just may be a little while longer now. Man, please tell me you have some hooks or something on that porch space for some hammocks! Oh yeah, nice info on the tent. Thanks for posting these pictures as it accurately and clearly shows the enormous size of the interior. Although the canopy slopes at each end, there appears to be a lot of room for side sleepers without touching the canopy with a shoulder. Look forward to hearing about the field test. I know I didn’t post pics of my laying inside the bags but I will. For now though I will tell you it is fine, for me. I am 5’10” and I experienced no problems when laying inside. I was also happy to find that the pads are not squished together in the middle. Here again, I will post more pics.